Better yet, subscribe to Airspeed through iTunes or your other favorite podcatcher. It’s all free! We did it! 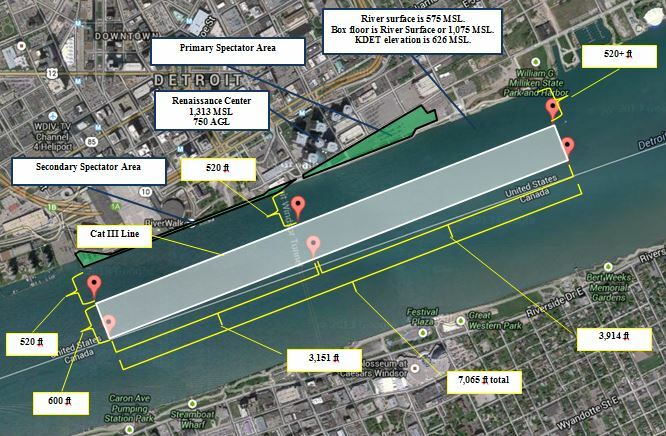 We put on a full-up airshow over the Detroit River in some of the most challenging airspace in North America. In this episode, David Allen takes the bully mic again and Dean Greenblatt (“BIRD” during the show) joins Steve to talk about what went right, what went wrong, and what’s in store for the show next year. Hear how we put a jet, three gliders, and lots of other aircraft up in this box and managed to do it despite low weather on Saturday, communications SNAFUs, and the fact that nobody on the crew had ever put on an airshow before. It’s an exciting story of what can happen when a dedicated crew of volunteers gathers together to turn dinosaurs into decibels. Many thanks to Jo Hunter for the great photos! 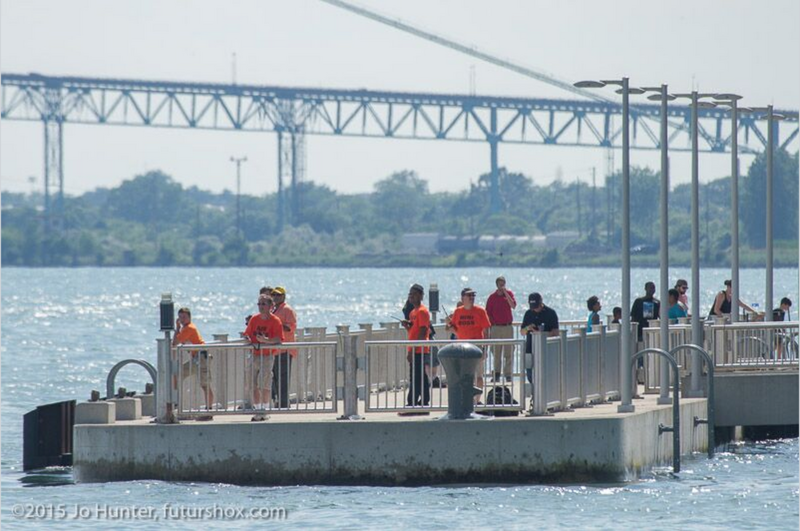 This is the third installment of the series that covers – in near-realtime – the events leading up to the GM Detroit River Days Airshow on the Detroit River 20-21 June 2015. As before, David Allen of Other People’s Airplanes has taken the mic and is running the show in order to keep things moving. In this installment, our heroes announce performers and deal with riverboats, timing changes, weather planning, and other exciting stuff. If you’re following along at home, the lead image shows the new box configuration and the image below shows the former box for comparison. We had to push everything back by a distance equivalent to the beam of a riverboat (62 feet), which squeezed the west end of the box down to 520 feet. The good news is that we just abandoned the rectangular shape of the box and pushed the back of the box all the way to the Canadian border. The border does not run parallel to the US shore, but rather dives a couple of degrees south. Thus, the east end of the box is now 780 feet wide. And the other good news is that the crowd is concentrated toward that end of the box. 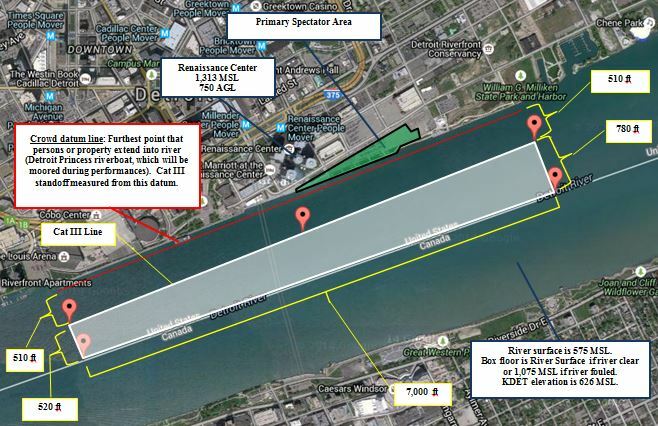 It also requires some fancy footwork to coordinate with the riverboat and the other large charter traffic on the river to assure that we’ll have a sterile area. Here’s another shot that appears in the supplementary materials for the waiver. You can see the riverboat over there on the right-hand side of the picture and the datum line that we’re using for the whole shore. 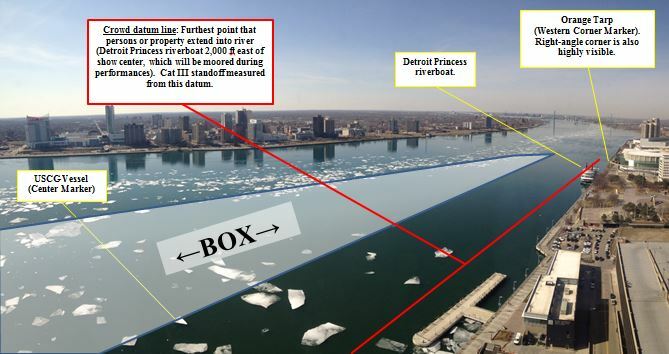 The datum is at least 70 feet from shore at all points and the CAT III line (the closest approach of performing aircraft) is 510 feet out from there. If you really want to go inside baseball, you can see a copy of the waiver by clicking the image above. Stay tuned. There’ll likely be at least one more episode before the show itself. In the meantime, you can see the River Days event page for the airshow here. Thanks to Brad “Launchpad” Marzari for his questions submitted through Facebook. Subscribe to Airspeed through iTunes or your favorite other podcatcher, listen to audio at http://airspeed.libsyn.com, or download directly at http://media.libsyn.com/media/airspeed/AirspeedHunter.mp3. It’s humid and still at Sandusky County Regional Airport, about two hours’ drive from Detroit. The kind of weather that makes for smooth air and good flying, but limits visibility to about six miles and washes out the features of the farms in the distance. Not unlike a dreamscape where the world fades into obscurity at the horizon. I’m playing hooky. I’ve spent the last few days making sure that my clients are taken care of. My voice mail is telling callers that I’ll take care of any emergent matters in the afternoon. Same with my e-mail. Right now, I am focused on other things. Right now, I am standing on the ramp on the broad plain of northern Ohio watching an airplane taxi in. It’s a red biplane and it’s gorgeous. It’s a muscular-looking aircraft. It’s 20 feet wide and about that long with reinforcement everywhere. An improbably-sized engine compartment and large three-bladed propeller complete the effect. It turns back and forth as it taxis because the pilot can’t see over the cowling while the airplane is on the ground. In just a few weeks, this aircraft will dance through the skies above tens of thousands of upturned faces at the Selfridge ANGB Air Show. But, for now, it’s just me, the red biplane, and a few other transient aircraft out there on the ramp. I’ve arranged to meet pilot Brett Hunter here to interview him and to see the plane up close. 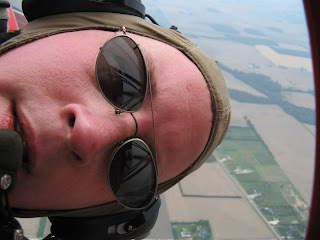 Brett is an experienced commercial and aerobatic pilot who lives on a grass strip in Waynesville, Ohio. His wife, Debbie, has come along in the plane for this appearance at the Sandusky County Regional Airport. She occupies the open-air forward cockpit while Brett flies the airplane from the rear cockpit. The aircraft is singular of purpose. No mere pleasure aircraft this. It started out as a Pitts S-2C aerobatic biplane manufactured by Aviat Aircraft Co. in Afton, Wyoming. It’s still mostly a Pitts S-2C, but Brett has modified it so thoroughly that it no longer conforms to its manufacturer’s type certificate and is now registered as an “experimental” aircraft. Aviat’s website says that a production Pitts S-2C will get off the runway in less than 900 feet, climb at about 3,000 feet per minute, go straight and level at 194 miles per hour, and withstand speeds of 212 miles per hour. But this plane betters these numbers in every respect. It has none of the gyroscopic instruments that you’d expect to see in regular aircraft. The aerobatic maneuvers that it performs are enough to cause nervous breakdowns in any but the most hardened military instruments. I’ve seen the videos from Brett’s website. With the right weather conditions, Brett can hang the airplane on its propeller and sit there suspended in space before air show crowds. Or literally hurl the airplane around the gyroscopic center provided by the prop and tumble in seemingly impossible attitudes before recovering as though it’s the easiest thing in the world. 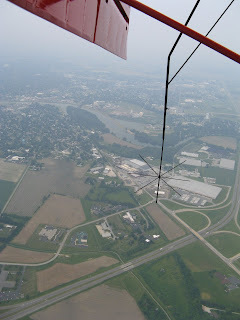 After Brett secures the aircraft from the flight over to Sandusky, we do a walk-around and talk a little bit. Man, it’s a beautiful aircraft and you heard Brett. He’s a consummate pro. He really knows his aircraft and his industry and in as eloquent an interview subject as I’ve ever heard. Now you could once again be forgiven for thinking that this is a pure interview episode. And that was a great interview. But this is not the only communication I’ve had with Brett. We’ve arranged a few things by e-mail prior to this meeting. And now I get to say the thing that I can hardly believe I’m saying . . .
That’s right. An ultra-hot modified Pitts S-2C aerobatic aircraft. And it’s red. And I’m about to strap in and we’re going up. Brett helps me into the parachute harness. I cinch it down around my thighs and wiggle into the shoulder straps. The parachute itself is packed in a container about the size of a stadium cushion that hangs down behind your backside and you sit on it when you get into the plane. It’s good to sit on the parachute because I’ll be strapped into in an open cockpit and it would be very bad if the parachute somehow escaped its container in flight. Then I climb carefully into the front seat. It’s a tight squeeze, but that’s to be expected. After all, the airplane is not primarily designed to carry passengers. Once in, Brett walks me through the restraint systems. One system of belts that goes over the tops of my thighs and up between my legs and another system that is like a regular airliner lap belt. At the same time, Brett gives me the safety briefing. It’s thorough. Brett has done this before. Most interesting is the bail-out procedure. In the unlikely event that I have to bail out, I have to pull two buckles, kick free of the cockpit, count off enough time to be sure that I’m away from the aircraft, and then insert both thumbs in the D-ring of the parachute ripcord and yank on it. I rehearse mentally. Pull, pull, kick, count, yank. Pull, pull, kick, count, yank. Okay, I can do that. Wait. I have a camera, some audio equipment, and lots of cables in my lap for recording the experience. So that’s going to be throw, throw, pull, pull, untangle, kick, untangle, wiggle, untangle, pull, kick, count yank. Add curse as needed. Okay, got it. Brett tells me that the command to bail out is simple enough. If it becomes necessary to part company with the aircraft other than back here on the ramp, he’ll shout, “Bail out! Bail out! Bail out!” He also tells me that, once I hear that command, further conversation will be pointless because I’ll be alone. He’s only half joking. Actually, he’s not joking at all. Brett pulls out a two-quart Zip-Loc bag and explains its purpose. Its purpose is not to carry my lunch. At least not before I’ve eaten it. Brett offers to carry the bag and hand it forward to me if I need it. I both decide not to tell Brett that I already have a pilfered Northwest airsick bag in my pocket against just such an eventuality and decide to carry the offered Zip-Loc bag up front tucked under my harness. I know a thing or two about airsickness and I know that it actually helps to have the bag handy. It tends to be needed less if it’s right there and available. Frankly, I’m a lot more concerned about the airsickness issue than anything else. I have a parachute and I’m actually safer in some respects than I am in my regular flying back at Pontiac. It’s hurling all over Brett’s shiny red airplane that has me a little worried. 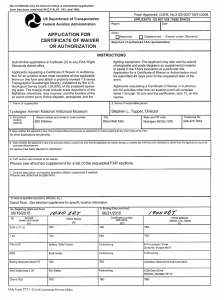 I’m a 150-hour private pilot and nearly instrument-rated. But most of my flying has been a lot like driving a car. I did two spins (relatively benign maneuvers where the airplane rotates lazily while in a nose-down attitude) during my private pilot training, so that I would be able to recognize them and recover if necessary, but that’s about it. Brett, on the other hand, has been flying for more than 16 years, performing in air shows for three years, and flying this airplane since 2000. He has more time upside down than some fighter pilots have right side up. I’ve read the operations manuals of the Blue Angels and the Thunderbirds. They state diplomatically that they would rather that journalists who go up on media rides with the teams not dwell on airsickness or how funny (or unfunny) it is to hurl in a supersonic military fighter and whether one is able to get the boom microphone out of the way in time. Okay. I see their point and I won’t dwell on it, either now or if I ever get a ride with a jet team. But anyone who goes up on an aerobatic ride is foolish not to wonder how they’ll react. Even mighty NASA has a hard time predicting how astronauts will react to zero-g and other odd inertial environments. Medical doctor, Michigan native, and Space Shuttle and Mir astronaut Jerry Linenger remarks in his books that it’s impossible to tell who will succumb to space sickness. I’ve interviewed NASA Ames motion sickness expert and scientist-astronaut Dr. Patricia Cowings and she says much the same thing. 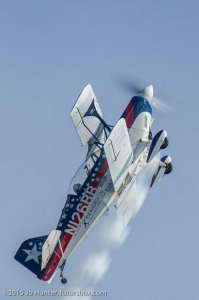 As an air show performer and consummate promoter, Brett’s aerobatic experience has included many opportunities to take up a lot of non-aerobatic pilots and non-acrobatically-inclined members of the media. Brett doesn’t want to hose down the front seat of the aircraft any more than I want him to have to. We’re going to be frank with each other up there. And I’m going to be frank with myself. And, in any case, I’m not going to dwell on it. Especially not here on the threshold of my first aerobatic experience. 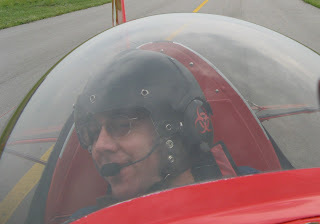 I’m strapped into a hot red biplane about five minutes from launch and I’m absolutely giddy. I’m situated. The audio cables are situated. The camera is ready to go. Brett climbs in and fires up the Magnum-converted engine. We taxi to the end of the runway while doing radio checks and other preflight prep. For Brett, that means checking out the engine, the magnetos, and the flight controls. For me, that means checking that nothing will fall out of the airplane when we go inverted. Including me. A quick note about the audio here. I performed no processing on the audio other than setting the mix and splicing the content. I was amazed when I got on the ground at how quiet the whole thing was. Brett makes a few remarks about PS Engineering (www.ps-engineering.com/) and a couple of other sponsors and I’m always up for that on the podcast. But his comment about PS Engineering is no idle praise. Bear in mind that this is a screamingly, howlingly loud engine attached to what amounts to an aluminum resonating chamber on wings and I’m in an open cockpit with a 200-knot-plus prop blast surrounding me. And yet the audio is better in many ways than what you hear when I record from the cockpit of Cessna 172s. This is a quality system. Then we’re taking the runway. It’s all business. The engine roars. I can feel the 200+ knot prop blast flowing just over my head. The tail comes up almost immediately and I can see over the nose down the runway. We’re galloping headlong and flat out down the ribbon of pavement. Brett rotates off the runway and we’re in a maximum performance climb and gaining altitude at 3,000 feet per minute. Think of it as riding on an elevator that’s rising at 35 miles per hour (not to mention doing 100 miles per hour toward Cedar Point). In less than two minutes, we’re at altitude and heading back west to find some airspace to carve up. This is cool. This rocks! The wind sings in the wires and the scenery below whips by. Time for some aerobatics. Brett starts with the aileron roll. Nose up a little, then the world rotates around us until we’re back level. No real sense of maneuvering. Just the world rotating. Brett’s good. We set up for the next maneuver: The loop. A word about g-forces. Pilots measure the forces that they experience in aircraft in terms of the number of times the normal force of gravity at Earth’s surface. They call each multiple of earth’s gravity a “g” – short for a “gravity.” I weigh about 210 pounds standing there on the ramp. At three g’s, I would be pressed down into the seat as though I weighed 630 pounds. No big deal if you’re used to flying with a refrigerator in your lap. The US Navy Blue Angels, who will perform at Thunder Over Michigan at Willow Run a few weeks before the Selfridge show, regularly pull six g’s. 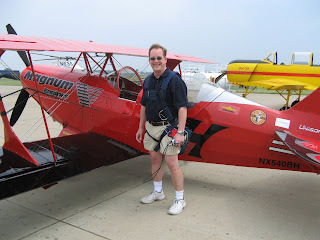 At that acceleration, I’d effectively weigh more than the two-seat Cessna 152 aircraft in which I have trained. Brett regularly pulls eight g’s during a show routine. Brett warms up with a steep turn to see if I’m okay with the g’s. When I do steep turns in training, I normally do them at 45 degrees of bank; with the wings halfway between level and perpendicular to the horizon. Brett does them at 70 degrees of bank and pulls hard through them. We’re around at three g’s and I’m fine. I tell Brett that I’m good to go for the loop. The nose comes down a little to pick up airspeed. The engine howls. We’re doing about 180 miles per hour when Brett pulls up and the horizon disappears. We’re vertical and then we’re inverted. The g’s let off through the top of the loop and then we load up again as we’re vertical again and then pulling out of the dive on the back side of the loop. My cheeks feel like they weigh 20 pounds and my head wants to tip forward, but I hold it up. I check in with my stomach. No problem. We maneuver around some more. I’m really liking the feel of this airplane. Gorgeous red wings slash through the pale haze over the land that gave birth to powered flight. We dance over the factories and farms, a gossamer scarlet apparition over the sleepy early spring landscape. Time for the hammerhead turn. The entry is a lot like the loop. We drop the nose a little and pick up airspeed. We’re going more than 200 miles per hour when Brett pulls the nose straight up and hangs the airplane on the prop. The weight of a refrigerator is once again briefly in my lap. Then it’s on my back. Up and up we climb. Shortly, the g’s let up and we approach weightlessness. The plane rages against the planet’s gravity and claws for purchase in the warm spring air, demanding and earning each additional foot of altitude. We’re practically a helicopter now; hovering somewhere between Ohio and outer space. It is ethereal. It is transcendent. Behind me, Brett dances with aileron, elevator, and rudder in perfect balance. He can ignore the throttle for the moment. The airplane knows what to do with that. It just howls. Just as I begin to float off my seat against the restraints and the audio cables in my lap begin to behave as though they’re in a scene from Apollo 13, Brett eases the rudder over. The airplane pivots slowly and gracefully on its left wingtip. The nose falls through the horizon, first slowly and then at a faster rate. I can turn my head to the left and see the earth 3,000 feet straight down. Then we’re heading back down and picking up speed at an amazing rate. Is that corn? Soybeans? Whatever it is is getting closer rapidly. Brett pulls on the stick and we get heavy again as he pulls out of the dive and then we’re bleeding off speed and flying straight and level in the opposite direction from when we started. A little straight-and-level flight now to collect my wits. Brett chats the entire time, explaining each maneuver and where it fits into the aerobatic repertoire. Time to go inverted. 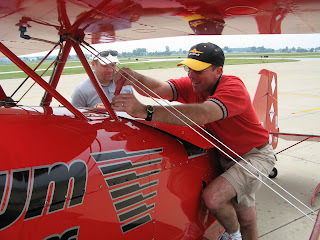 We check our harnesses (especially me, as the guy with no canopy between him and the wild blue yonder). Brett pops the nose up a little and then rolls the plane inverted. Sky and earth exchange places over the nose and I’m hanging from my restraints in the open air, flying upside down and most of a mile up. I think my hair may be on fire, too. We roll back upright. My stomach and my vestibular system stay inverted. Hmmm. I verify that the Zip-Loc (and, for that matter, the Northwest bag) is still there. No immediate issue, but I am definitely a little green around the gills. Have I mentioned that Brett is a consummate pro? I allow as how my stomach has finally objected to this admittedly unjust treatment and that a little straight-and-level flight might be appropriate. We cruise along and chat about my instrument rating and the aircraft I’ve flown and Brett even diplomatically calls my attention to a land feature on the horizon. I know that the land feature doesn’t matter as much as getting me to focus on the horizon. Focusing on the horizon is one of the most basic techniques of combating motion sickness. Brett’s being helpful while allowing me to save face. Rats! There’s more to see and do up here, but we conclude that discretion is the better part of valor and head back to the airport. On the base leg of the pattern as we’re coming in, Brett keeps up the demonstration by reducing the throttle to idle with a half mile to go and gliding it in for a beautiful landing. I’m not sure of the exact moment that the main landing gear touch down, which is the measure of a perfect landing. Brett doesn’t gloat, but I’ll bet that he’s happy with the landing just the same. We taxi back to the ramp disengage me and my rat’s nest of audio cables from the aircraft. I stagger around the ramp for awhile and shoot pictures as Brett pulls off the front windscreen and screws down a piece of custom sheet metal over the cockpit where I had been sitting. He is scheduled to have the airport to himself in about 30 minutes to practice and he’s reconfiguring the aircraft to get it ready for the show. I thank Brett and then stagger back to my car. I have a conference call in an hour that I’ll take in the car as I dodge orange barrels and other traffic the way back to metro Detroit. The real world closes in all too quickly. But in quiet moments since that morning, I have found myself in a red biplane, weightless and precessing gracefully around a wingtip as the horizon rotates obediently to the command of Brett Hunter. I hope that there are lots of other hammerhead turns in my flying experience. But I will always remember that one. I’ll be at Selfridge on July 21 and 22. Like the tens of thousands of others, I will turn my face up to the sky and see the performers and demonstration teams wheel back and forth across show center. And, when Brett takes the field, I’ll remember with satisfaction that I had the chance to experience some small piece of the flight envelope that Brett stretches so well. When we gather at places like Selfridge – and Willow Run and Battle Creek and Oshkosh and Sandusky and wherever else daring men and women hurl their aircraft through the skies – we celebrate aviation as the singular human endeavor that it is. We celebrate confidence, skill, endurance, and every other quality to which we aspire and we do our best to take some of it home in our hearts. Even when there’s no air show, we stand with out fingers entwined in the fences of any of 2,000 general aviation airports in America and watch the airplanes depart and arrive to and from destinations unknown. We see it in F-16 Fighting Falcons and the C-130s of the 127th Air Wing, in the KC-135 Stratotankers of the 927th Air Refueling Wing, in the HH 65C Dolphin Helicopters of Coast Guard Air Station Detroit, in the Space Shuttle, and in the Cessna 172s and the Cherokee Archers that are ubiquitous in our summer skies, and in all other manner of flying machines. But most of all, we see it in hot red biplanes.